4.0 oz 80/20 cotton/poly blend. 2 chest pockets with button flaps. 2-piece western back yoke. Inverted back pleat. Button Cuffs. Pull up sleeve placket. 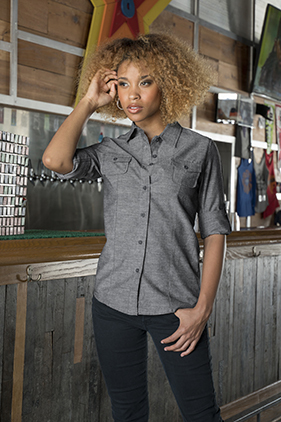 Tapered ladies fit. Modern Fit.